At CES, we had the opportunity to see a couple of HD videoconferencing systems in action. At ShowStoppers, we saw the Vidyo teleconferencing system, and later, on the show floor, we stopped by to learn more about Biscotti. Vidyo is aimed at SMBs (Small and Medium Businesses) who want the high end teleconferencing features provided by vendors such as Polycom and Cisco. However, they add a twist to their solution by using commodity hardware in their systems. The most interesting aspect of their encoding system is the use of SVC (Scalable Video Coding), one of H.264's recent features. In layman's terms, the encoding is done in layers, such that decoding of the video stream is possible at different qualities depending on the network bandwidth available or sink configuration. For example, in a HD videoconferencing solution, the streams in the PiP segments don't need to be decoded at the maximum resolution while the main stream is bound to be of higher resolution. With SVC, it is possible to just encode one stream at the source and let the bandwidth at the destination be allocated to different input streams. Vidyo's main selling point is the fact that they do not need specialized hardware at each endpoint. Currently, raw video from a webcam is fed to the software encoder running on a PC / PC-like endpoint system and then processed and set through the VidyoRouter to the other endpoints. However, full HD (1080p30) webcams operating over USB 2.0 don't deliver raw video, but encode it in H.264 themselves, which doesn't work out for Vidyo's systems. At ShowStoppers, they were showing a 1080p capture system delivering video over HDMI and a HDMI capture card being used for delivering raw frames to encode with Vidyo's software encoder. With USB 3.0 becoming popular, it is possible that webcams will soon deliver raw 1080p video at higher frame rates directly to the PC. 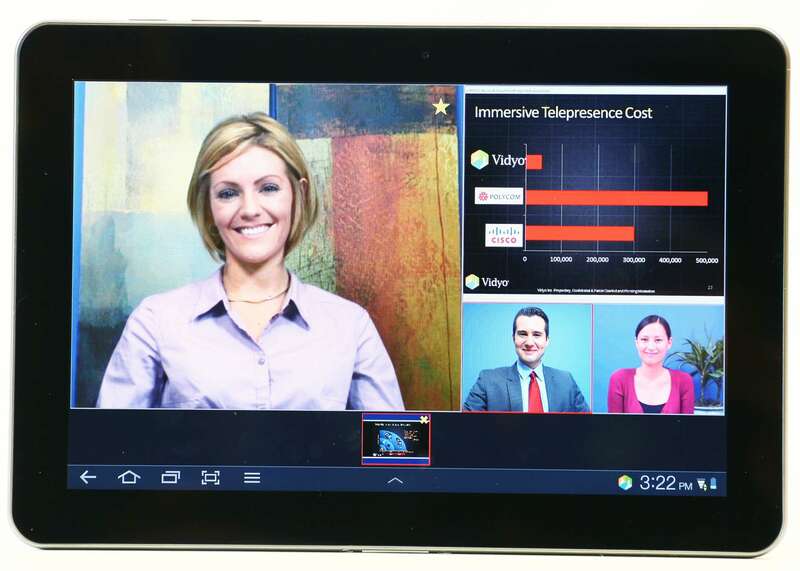 At CES, Vidyo also showed that their videoconferencing client (SVC capable decoder) could run on some of the recent Android and iOS devices including the Kindle Fire, iPad2, iPhone 4S, Samsung Galaxy Tab 10.1, Motorola Xoom and Samsung Galaxy S II and the Samsung Galaxy Nexus. HD videoconferencing solutions for the home consumer are still in a nascent stage (except as part of the PC ecosystem). The Logitech Revue's camera add-on was probably the first high profile effort to bring videoconferencing to the TV (though TVs have been trying to integrate Skype functionality at a big price premium over the last year or so). In the last two months, we have seen the introduction of two devices with the primary aim of trying to address the TV-based HD videoncferencing market for home users. Biscotti and telyHD come in with support for Google Talk and Skype respectively, and, at CES, we had a detailed talk with the folks at Biscotti. Much has already been written about Biscotti, and I suggest reading Mashable's excellent coverage of the unit. In short, the system hooks up to your TV over HDMI and can also act as a passthrough agent for your STB / AV receiver's HDMI output (similar to the Revue box). The chat feature appears as an overlay. Biscotti touted the HDMI passthrough feature as an advantage over telyHD, but, personally, I don't see that as much of an advantage (particularly when there might be cases when you are using the antenna or cable connected without a STB or when the TV's component inputs are being used when receiving a call). I foresee this type of device being used more as a gadget for videoconferencing in an arranged manner rather than the spontaneous call attending that Biscotti treats it to be (I am also open to hear what readers think about this). For this purpose, a standalone HDMI-out is sufficient for the device. If it is going to be an overlay over already playing content, the system will need to be built into the TV. Ignoring the supported chat services, I think Biscotti has a two-fold advantage over the telyHD. In terms of pricing, Biscotti comes in cheaper by $50. The choice of the internal SoC platform for the H.264 encoder is also heavily in Biscotti's favour. While Biscotti uses a TI DM36x solution (found in many IP cameras), telyHD opted for NVIDIA's Tegra 2, a tablet / smartphone platform. If telyHD were doing a convergence device, I would have agreed with the choice. However, once a company makes the decision to make a product with a single primary function, it is better to choose a SoC targeted for that function (read, good video capture and image processing coupled with a good H.264 encoder provided by something like the TI platform), rather than a jack-of-all-trades, master-of-none SoC like the Tegra 2. It would be interesting to see a side-by-side comparison of the image and video quality between Biscotti and telyHD, but my educated guess would be on the TI-based Biscotti being much better. A solution looking for a market imo... Video conferencing away from the PC is still rare (a good majority of my friends and family don't even have smartphones with ffc), but even if it becomes ubiquitous I think people would rather pause their TV (or not) and take the call on their tablet/phone.